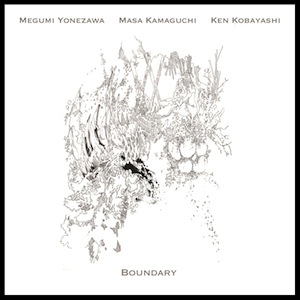 Personnel - Megumi Yonezawa: piano; Masa Kamaguchi: acoustic bass; Ken Kobayashi: drums. New York-based Japanese pianist Megumi Yonezawa co-leads a sharp new trio with fellow countrymen, bassist Masa Kamaguchi and drummer Ken Kobayashi. Integrity, freedom, and an extraordinary improvisational facility are part of the group’s philosophy, and Boundary proves their individual and collective value in the process of creating spontaneously from predetermined ideas. Toggling between the fragile and the firm, the title track is a sparse, unhurried, and deeply explorative piece that is ultimately taken by a stubborn tension. While pianist and bassist paddle in the same direction, the drummer, immersed in a precipitate brushwork, seems to get his own way without putting in cause the cohesiveness of the whole. “Meryon” is driven by a similar calm/tension duality. The initial vagueness and ambiguity, triggered by floating bass notes, will drive you to search the palpable, and yet, little by little, our ears begin to dig the virtuosic communication process between these three ramblers. Their steadfast actions end up in a compulsive dance of short high-pitched piano flurries, instinctive bass attacks, and intensive drumming. Alone and confident, Yonezawa slowly cooks a blend of fragmented phrases, loose notes, and parallel motions to compose the introductory section of “Alchemy”, a pure avant-garde exercise that grows considerably in intensity toward the end. The pianist creates fantastic shapes over the bass-drums foundation, which, despite vigorous, feels constantly unobtrusive to her moves. This is also audible on the energizing “Tremor”, a song that achieves a punchy rhythmic infatuation through a propelling, nearly swinging groove that supports the assertive exclamations and affirmations uttered by the pianist, who develops her phrasing from a specific rhythmic figure. Another stirring moment arrives with “Onement”, where a relentless note on the piano becomes the axis that will allow Kamaguchi to revolve around it with multiple acrobatic moves. Yonezawa brings in occasional counterpoint with the nuanced comping before the tune turns into a kaleidoscopic showcase for hypnotizing timbres. The language, rich and highly articulated, includes trilling obliques, penetrating harmonic progressions, and epic rhythmic strolls. Even the most reflective moments convey an intrinsic complexity whose wide emotional range feels enthralling. It happens not only on “I’ll Be Seeing You”, a jazz standard captured with the freedom of a non-standard and piqued by the background stimulus of Kobayashi’s chops, but also on the wishful “Veil” and “Nostalgio”. The plenitude of a fully integrated trio sounds like this. Boundary takes you to unimaginable places, making you not to want to return to your point of origin. Consequently, I hope this visionary Japanese trio has plans to continue experimenting together in the future.